I stumbled across your website and found it so interesting that I dug this doll out of a dark closet! She probably has no value, but for giggles, perhaps you can give me some info on her. The mark is U 39 and as far as I can tell she is made of hard plastic, the eyes open and close. Thank you for your time. These were called "bed pillow or boudoir dolls" and were very popular in the 70-80's. The dolls were mostly the same with different hair colors and hair styles but mainly the "Southern Belle" style. 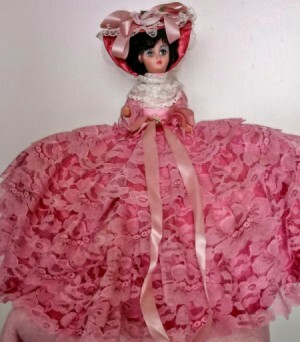 The dolls were usually very cheap but looked very nice when dressed in their ball gowns. The dresses were usually crochet but other materials and lace were also used. The skirt was always very full and would be placed on a young girl's bed or dressing table. In later years, Barbie dolls were used and these are usually worth more money but there is still a chance your doll could sell for $30-50 dollars. The best sites to sell dolls are eBay and Etsy but many times more money can be realized if sold on a local Craigslist as there is no shipping involved and the interested person can see the doll before buying. There were also a lot of smaller dolls made in the same fashion and these are still popular. you can check out some of the similar dolls presently listed on eBay. You can go to www.dollreference.com and research this mark. You could also go to a doll dealer. I personally am not familiar with this doll marking.